Ford did an amazing job when they designed the interior of the GT500, however they didn't give you any choice as to the color of the shift knob. 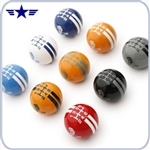 Well now we can help you with these new SHELBY GT500 shift knobs available in a multitude of color and stripe options. Exquisitely made with the utmost quality in mind these shift knobs have the famous Le Mans stripe known so well on the GT500 as well as the infamous Tiffany Snake GT500 logo on each side facing straight ahead. Each shift knob comes with three different adapters to allow fitment on these shift lever thread patterns, 10mm x 1.25" (2010+), 12mm x 1.25" (2007-2009), 12mm x 1.75" (Shelby Shifter). 2005-2009 Shelby GT and Ford Mustangs GT with stock shifters or with a 12MM x 1.25" thread pattern. The boot retainer (NAT-1618 or NAT-1714) secures the shifter boot on Ford Mustang Shelby - 2010 to 2014 (factory installed) when installing a new aftermarket Shelby "ball style" shift knob.